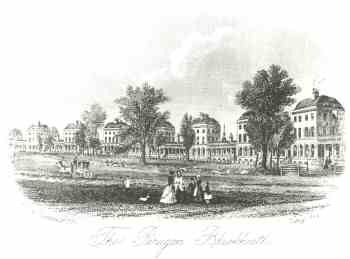 The Paragon was designed by Michael Searles for John Cator, and built between 1795 and 1806. Intended for the upper middle class, the linked pairs of houses provided room for carriages, stables, servant's quarters and large gardens. After 1914 several became hotels or boarding houses. Severely damaged during World War ll, they were restored by Charles Bernard Brown between 1949 and 1958 and were converted into flats. Engraving published by Rock & Co., 11th August 1864.